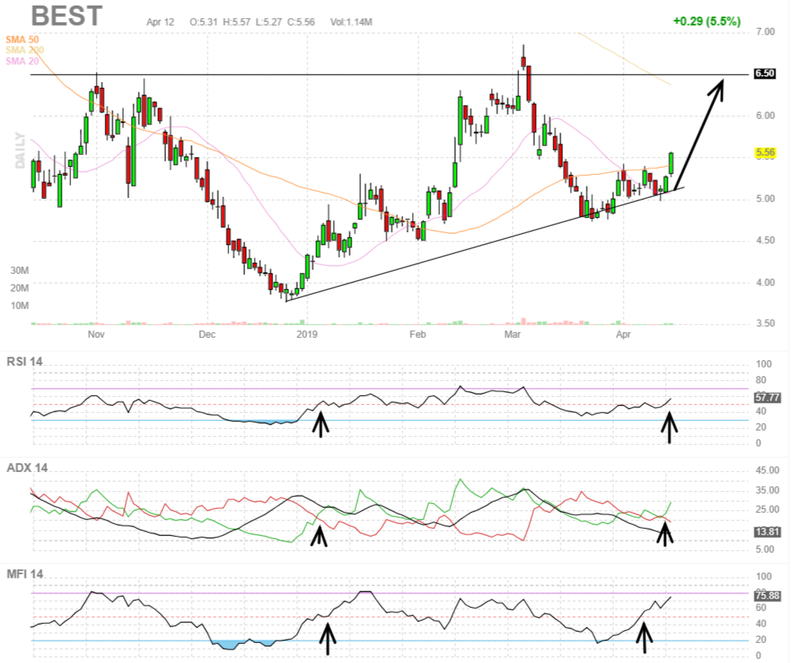 Two sample Breakout Stocks for Week 16 with better than 10% short-term upside potential. Last week PPDF gained +23% and is the 6th stock in 15 weeks YTD to move above 20% and the 18th stock to gain more than 10% in a week. Continuing from the start now makes it 84 out of 100 trading weeks (84.00%), with at least one stock move 10% or greater in 4 or 5 trading days. Two Best of the Dow 30 for mega-cap selections this week with strong breakout conditions are NIKE Inc. (NIKE) and Intel Corporation (INTC). 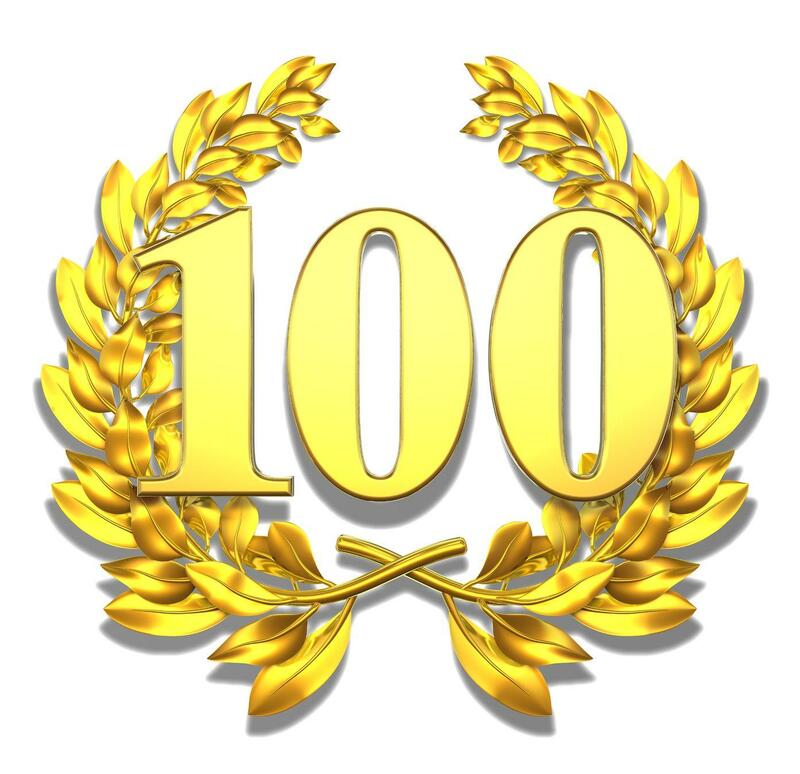 The Weekly Breakout Forecast has reached the 100 week milestone of public forward testing and continues my doctoral research analysis on MDA breakout selections over more than 5 years. Thank you for being a part of this ongoing experiment to generate the best short term results for high frequency breakout stock selections! In 2017 the sample size began with 12 stocks, then 8 stocks in 2018, and now at members' request for 2019, I generate 4 selections each week. Remarkably, the frequency streak of 10% gainers within a 4 or 5 day trading week remains at highly statistically significant levels of 84 out of 100 weeks (84.00%). More than 150 stocks have gained over 10% in a 5 day measurement period since this MDA testing began in 2017. The historical results are likely affected by the diminishing sample sizes I am now using from the start of the study. Scholars estimate that 30-40% of all stock price behavior is unpredictable event surprises and that idiosyncratic risk increases as the sample size has been reduced by nearly 70% to 4 stocks. Another important factor has been the use of the Momentum Gauge signals that crossed negatively in Week 39 last year ahead of the October market drop. For the study I continued to publish selections each week in the downturn to test the model while warning investors not to trade into these strong negative momentum conditions that lasted into December 2018. Using the Momentum Gauge Control Chart that signaled a clear exit in September last year, the actual all time Breakout Stock return is well above 98%. The new CFO Insider Trading Anomaly study is up +9.38% from the start of April showing very significant results early in the test. The evidence is strong that you can outperform the worst-case fixed 1-week, equal weighted minimum return measurement shown above in the 1 Week Close (blue line). The best results are now coming from longer term holding periods beyond one-week. 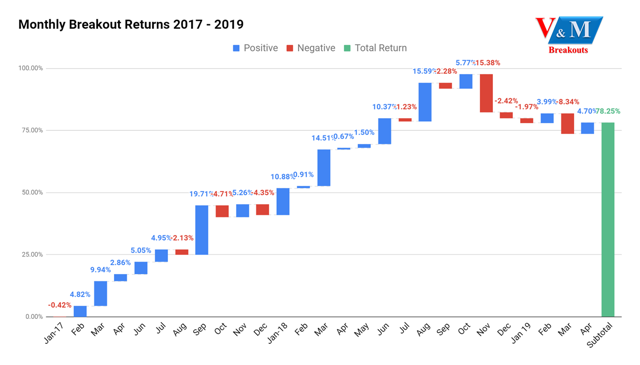 This is showing a return to prior patterns in 2017 and 2018 where a fixed three and four week holding pattern became the optimal period as more data was acquired. As I always tell traders, don't fixate on holding periods or arbitrary price targets. The best gains are made by monitoring the conditions of the indicators that signaled a strong buy in the first place and hold as long as these buy conditions remain intact. 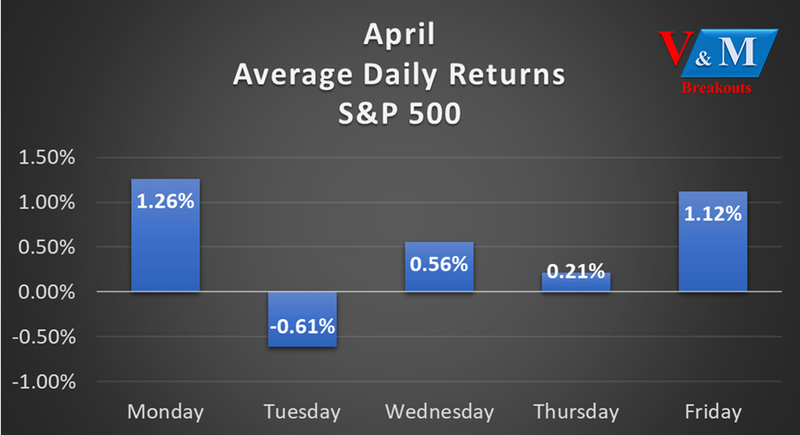 Into the 2nd week of April, Monday and Friday remain the best days of the week with Tuesday by far the worst performing day. Now with 60 stocks selected into 2019 the average top gain within 5 days has been +7.98%. Momentum conditions remain strongest among these prior breakout stocks from prior breakout weeks YTD: FinJin Holdings (FNJN) +10.68%, Keane Group (FRAC) +23.17%, Daseke (DSKE) +26.51%, FormFactor (FORM) +22.42%, Patterson-UTI Energy (PTEN) +19.97%, AcelRx Pharmaceuticals (ACRX) +17.30%, PPDAI Group (PPDF) +33.92%, Earthstone Energy (ESTE) +14.02%, Qudian (QD) +10.87%, W&T Offshore (WTI) +22.40%, eHealth (EHTH) +10.15%, YETI Holdings (YETI) +29.66%, Rigel Pharmaceuticals (RIGL) +3.35%, Pixelworks (PXLW) +18.32%, PPDAI Group (PPDF) +23.02% and the current set of Week 16 Breakout stocks. 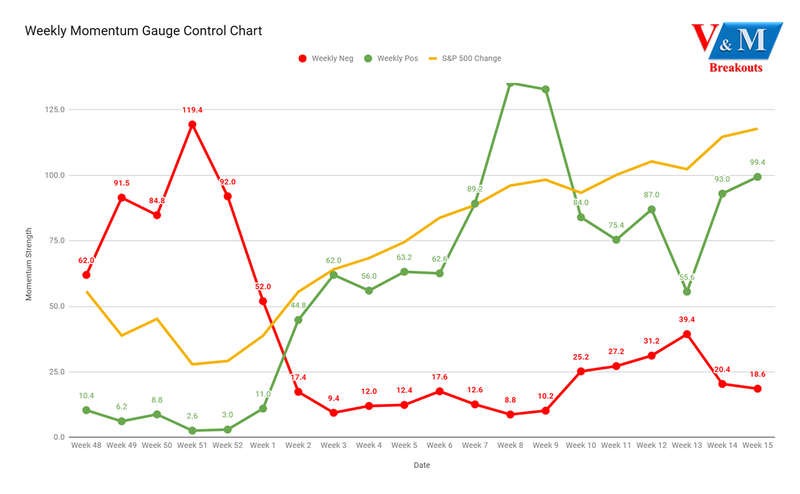 The Weekly Momentum Gauge chart shows continued high sustained positive momentum. We have seen that these convergences between positive/negative scores have occurred prior to market declines. Scores still remain high positive and low negative through the past Week 15 Breakout. The spread between Positive / Negative values has reached the widest gap between the two measures since February. This could also represent an overextended condition with a higher probability of pull-back potential in the next couple weeks. The two Breakout Stocks to start the week consist of one healthcare and one services sector stock. BEST Inc. operates as a smart supply chain service provider in the People's Republic of China. Its proprietary technology platform enables its ecosystem participants to operate their businesses through various SaaS-based applications. The company applies its technologies to a range of applications, such as network and route optimization, swap bodies, sorting line automation, smart warehouses, and store management. Inspire Medical Systems, Inc., a medical technology company, focuses on the development and commercialization of minimally invasive solutions for patients with obstructive sleep apnea (OSA). It offers Inspire system, a neurostimulation technology that provides a safe and effective treatment for moderate to severe OSA. 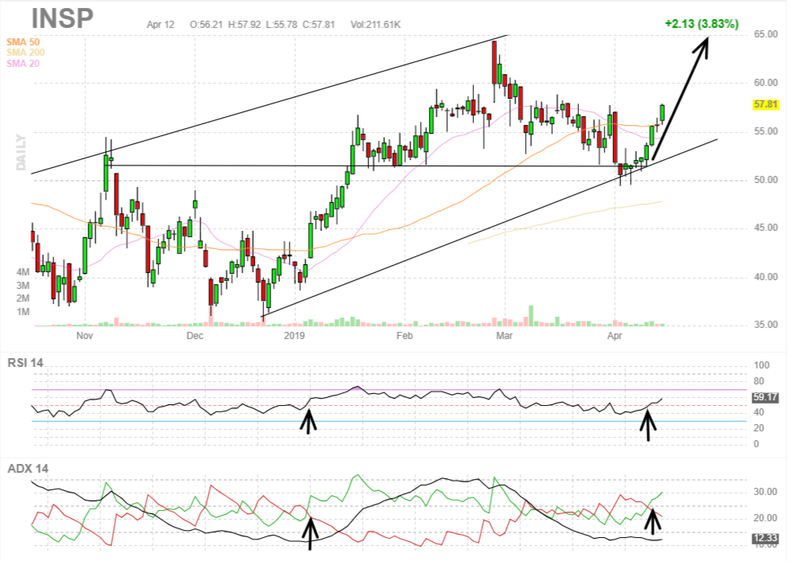 Indicators all strongly positive with breakout conditions ready to retest 90/share top of the positive price channel. Technical conditions very favorable with high fund inflows, watch for a new 52/week high. Strong and accelerating technical indicators support a price break above 52 week highs this week. Net inflows are strong and increasing with price showing momentum conditions to move above 58/share in the short term. These stocks continue the live forward-testing of the breakout selection algorithms from my doctoral research with continuous enhancements over prior years. These Weekly Breakout picks consist of the shortest duration picks of seven quantitative models I publish from top financial research that include one-year buy/hold value stocks.